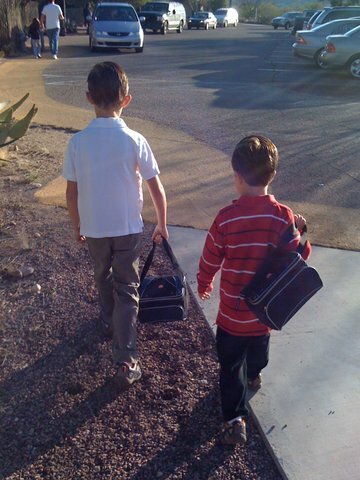 Six years ago — our final “first day of school” photo. Today was our first day of not school, and it looked pretty much like most other days for us. Ben, my 10-year-old, slept until about 8:30, then got up and unloaded the dishwasher, had some breakfast, got dressed, and played on the computer for a little while. Sam, my teenager, slept later – we didn’t see him surface until after 10:00 and even then, he wasn’t what you might call “awake” – “zombie-like” would be more accurate. After some waking up time and breakfast, he decided to watch an online tutorial about lighting elements in a virtual world he’s creating for a computer game, while Ben had moved out to a comfy chair on the sunny deck with his book. All of this is to say that I won’t be posting a “back to school” picture of my boys sporting fresh new school clothes and brightly-colored backpacks. I really wanted to – it’s an exciting time of year and we’ve been talking about everything we want to do in terms of projects, field trips, and learning goals; it feels like we’re at the beginning of something that should be marked with a photograph. I just don’t know which moment of our day to take a picture of. This is one of the (few) downsides of homeschooling – we’re on the fringes of something that we’re kind of participating in, but since we’re doing it our own way, many of the markers and milestones are different (or even non-existent) for us. For those of us who unschool (a type of homeschooling that emphasizes self-directed, student-lead learning), we’re even more on the outside of the mainstream. As a result, we will never have report cards or test scores, teacher conferences or picture days, all of which were very much a part of my husband’s and my childhood, marking our progress and achievements throughout the year. Even though we didn’t recognize this at the time, these common experiences provided us with a sense of momentum and growth, and also connected and bonded us with our friends and family. My sons won’t have these experiences, and I do feel a little sad about that – but only a little. The trade-off is well worth it. Sleep is practically a religion for us, and everyone in my family gets plenty of it (it’s rare that we ever set an alarm). I know to some people this will sound like we’re lazy, and I kindly invite those people to take a look at what science is telling us about the connection between sleep deprivation and rates of obesity, depression, stress hormones, and compromised learning ability. In my family we’re working smarter, not harder. The other benefit is that our mornings are gentle – no rushing, no frantic searching for misplaced homework or matching socks. We did that for several years, and I certainly know what it’s like and don’t miss it one bit. So, my apologies to the kids’ grandparents once again — there will be no “back to school” or class photographs to look forward to this year either. I will, however, take and share many pictures of happy, relaxed, well-rested boys who are building ship models or playing with their band or decked-out in costume for their current play. We will send you links to their blogs and will mail select works of art and, quite possibly, postcards from any cool places we visit. Hopefully that will do; we’re definitely excited. Posted on September 8, 2014, in Common Concerns, Education, Homeschooling, Parenting. Bookmark the permalink. Leave a comment.